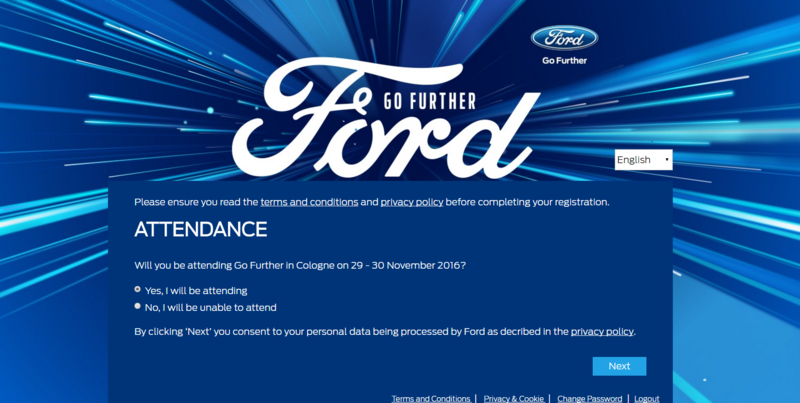 In association with Imagination, Dataflow were asked to build a system that would allow for the management of delegate registrations for the Ford Go Further Reveal. Various assets that would be needed had to be assigned using strict capacity management. The requirements also included a portal where all of the different markets and their coordinators could login and upload, invite, assign assets and manage the delegates from their specific market. In answer to the brief, the build was split into three parts that worked as separate websites but also in unison, as all sites linked together to form a platform where you could access all the necessary details under one roof. The design for the website was built within Ford branding guidelines. The floating textbox created a exciting, colourful website. Backend Admin Portal – this was to facilitate Imagination to have greater control of the markets and the delegates within them. It also gave them the freedom to create and assign to markets, assets such as sessions, accommodation and travel. Administrators were able to pull complex reports, send various emails and SMS’ from the system. They had access to dynamic documents like E-tickets and Visa letters which were then distributed to the delegates – this was a huge time-saver for the client. The Market Coordinator site was created as a portal for the co-ordinators to manage all of their guests. The Imagination team assigned flights, accommodation and sessions against the many markets which the Coordinators could then allocate to delegates. Furthermore, administrators could download visa letters, send communications, or be able to login as the guest and register on their behalf. The Guest Facing website was for guests to see what travel and accommodation arrangements had been assigned to them and to add additional personal details. Personal sensitive data such as passport information was encrypted throughout the site. Wanted to drop you all a note to say many thanks once gain for all your hard work, commitment and patience on Go Further. You are an amazing team who despite many curve balls, including council approvals and airline strikes, did a sterling job of making Go Further a real success on so many levels. Great feedback is coming in from many senior stakeholders and you should all be very proud in the part you played. Once again I was proved right to have your team on site as with the Lufthansa strike, it was imperative to have all hands on deck to input new travel and reissue JI’s instantly. A task simply not achievable from being remote. You can also see the end result which I hope gives you a real sense of achievement of what you have helped put together. You and Amy had the fastest fingers in the West when it came to assisting us, and the pivot tables Amy made to help identify our LH flights really helped us tie up the final loose ends. As you saw from the clients expressions, from their side, the event was an unprecedented success and once again you have proven yourselves to be the best in the business as you make us look good! Always going the extra mile, I find it hard thinking of you as a supplier but as an extension of work colleagues and friends. Please extend our thanks to all the Dataflow wizards who helped us.